In this video I’m going to show you how you can prospect using Insightly CRM. If you have read the article, you know I’m pretty jazzed about Insightly. It’s a really decent CRM. Sure, I might think I’d like things to be different and sexier, but in all honesty, it’s easy to use and it provides the ability to add a lot of business process semi-automation (read sophistication) into your business. Any salesperson who isn’t using a CRM deserves to be broke. It’s just too easy to organize your work and sales using a CRM, and Insightly, all things considered, is probably the easiest I’ve used. You prospect Contacts, convert leads into Opportunities, and convert sales into Projects. You need to keep track of the status of the contact, the opportunity, and the project. 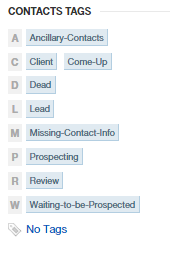 You do that with Contact Tags, Opportunity Tags and Pipelines, and Project Tags and Milestones.